I tried my first “beef on weck” tonight at, appropriately, the restaurant touted as the inventor of the famous Buffalo sandwich. Andrew and I have been meaning to go to Schwabl’s since we first saw it after we got here. You can read all about it here, but basically it’s an old, well-known hole-in-the-wall place that is known for its roast beef and seafood. Surprisingly, neither Andrew nor his parents had ever been, so the four of us met there tonight. One of the drinks they’re known for is called the “Ebenezer Punch,” which is a mixture of Southern Comfort, orange and lemon juices, lemon lime soda, and is only served during the summer. Andrew got one and it was tasty but tart. 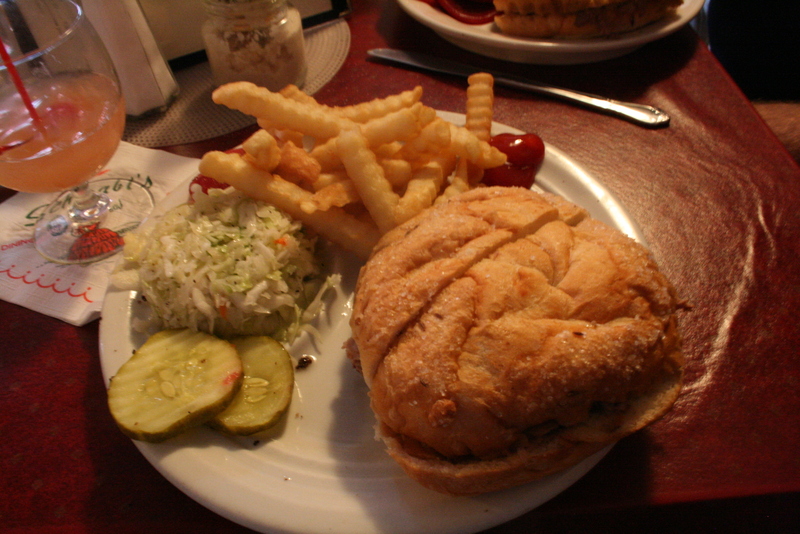 We all ordered the infamous “beef on weck,” which is essentially sliced roast beef served on a kimmelweck bun. Kimmelweck buns are large hamburger buns covered in salt. 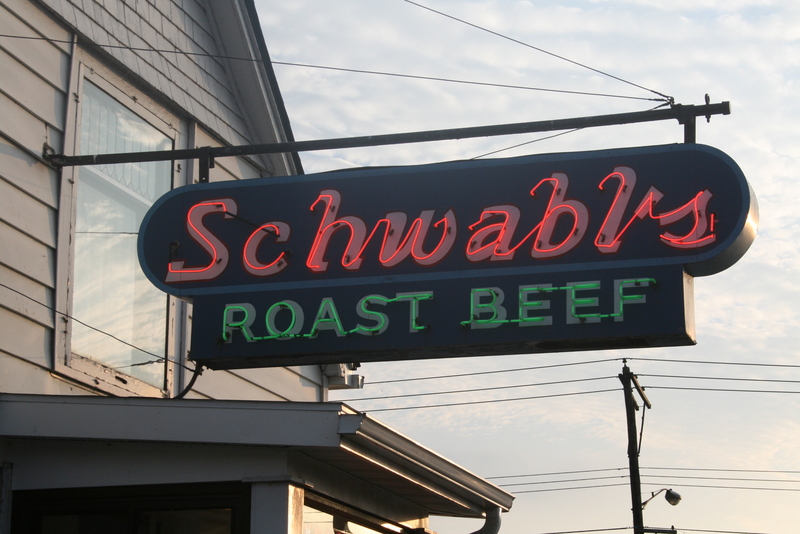 You can find beef on weck sandwiches all over the place, but apparently Schwabl’s is known for starting them, so I figured it would be a good place to give it a try. Andrew and his mom got fries on the side, as well as their vinegar coleslaw. You can see some of Andrew’s punch in the top left corner. The place is small; it might only have ten or so tables with a bar. Seating is limited, so it’s not uncommon to have a wait at prime dinner times. We showed up after 7 p.m. and had to wait just a few minutes for some people to leave a table in the front. The walls are covered in framed newspaper articles and plaques announcing “Voted Best Beef on Weck” from just about every local publication. What I liked the most was the customer service and homey atmosphere. Every waitress was 50+ and wore white uniform dresses, similar to a 50’s diner, but with less kitsch. The gentlemen servers and bartenders wore shirts, ties and white aprons. Everyone was more than polite and our waitress offered not once, but twice, to bring us samples of some of the sides we were debating about. Sorry folks, had to use the flash for mine. Andrew’s dad and I opted for the german potato salad instead of fries and I didn’t regret it. Look at all the salt on the bun! Traditionally, you’re supposed to put horseradish on your sandwich. Horseradish jars sit on Buffalo dining establishment tables just like ketchup and mustard do everywhere else. I love horseradish, but man does it have a kick sometimes! 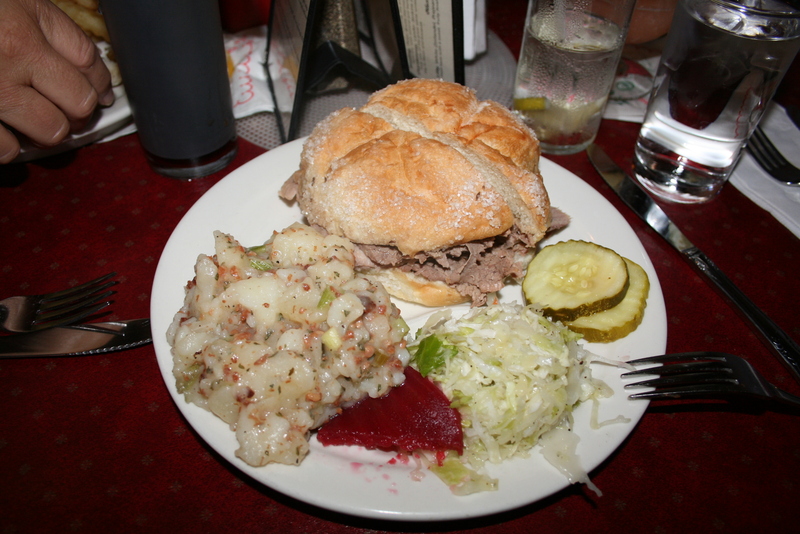 I don’t know that any of us thought it was the best beef on weck we’d ever had (it was for me since it was my first), but it’s definitely the kind of place you bring your out-of-town guests, or go to when you want that small, cozy, welcoming atmosphere. Or Hungarian goulash. Apparently they serve it on Saturdays, and only on Saturdays, for lunch and dinner. We’ll be back then. Posted on August 5, 2011 February 27, 2016 by thehealthypineapplePosted in #fabfoodTagged beef on weck, Food, New York.